Could Facebook’s “Trending” feature rival Twitter? The difference is personalization, it will interesting to see if Twitter responds to counter this threat. So far only the US, UK, Canada, India and Australia can access the new feature. Going forward for this to work it has to reflect the thoughts of the ordinary man in the street. So if topics like privacy and the state of the economy start trending, I would say Facebook is on to something, if it truly aspires to reflect true public opinion, but if it is used to reflect the opinions of celebrity bands and media outlets, then Twitter can rest easy. Do I want to wake up to see that Kim Kardashian’s latest perfume or book or what she and Kanye had for breakfast is trending? No thank you. Facebook’s latest tactic underlines an effort to boost engagement on the site by drawing interest with features that grab attention. 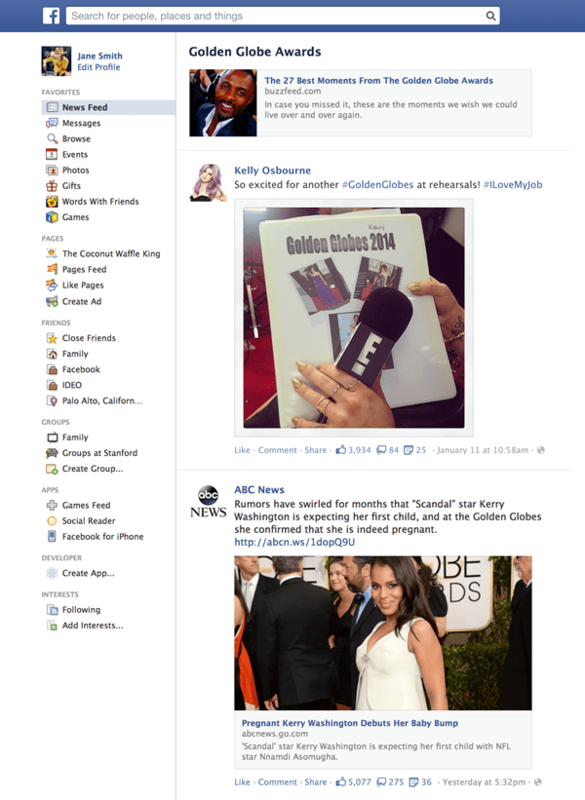 Facebook used the example above of the recent Golden Globes to demonstrate how the feature works and is currently testing it for mobile devices. As it stands, Twitter is still the network people and brands go to have public conversations about events in real time. You know what they still say? ‘Imitation is the sincerest of flattery’.